It’s time for another edition of The Look for Less, where I seek out great deals on stuff you need to make your home fabulous, for less! This week I scoured the internets looking for some reasonably priced tub chairs. I’ve been looking for one for my upcoming bedroom makeover, so I thought I’d share some of the ones that I’ve found, along with my honest opinions on the ones I’ve personally tested. 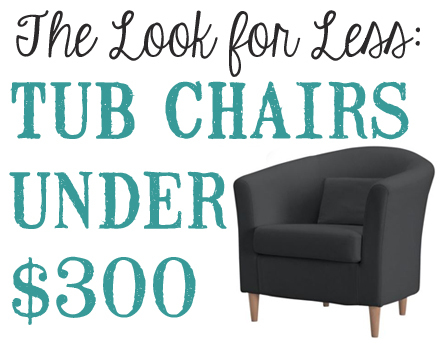 So, let’s take a look at tub chairs for under $300. The first option is from Overstock.com. I’m in love with the color, texture and tufting, but I haven’t personally tried it so I have no idea of the comfort level. But, for $299, it’s an amazing deal. It’s not the cheapest that I’ve found, but it is the one with the most detail, so it would make an amazing impact. Chair numero dos is from Wayfair, and is a lot more modern than the first one. Although I like the shape, I’m not really keen on the idea of no legs. If you are more into modern decor, this one is perfect. I’m a tiny bit more traditional, though, so it’s a little too modern for me. Oh, and it’s only $299, too. Target also has a similar version for $179, which is another that I’ve tested in real life. It’s a basic style chair, very similar to the one above. The last option is from Ikea. (Oh, y’all know I love that place!) Yet again, I’ve tried this one in person. It’s not the most comfortable of the lot, but it is the most inexpensive at only $99. If you need a piece to fill a spot that will rarely get used, it might work great. I hope that mine will find itself used a lot, so this wasn’t the best choice for me. I’m still on the hunt, but hopefully I’ll find the perfect chair soon – and of course, I’ll keep you posted! I agree…the IKEA chair is not the most comfortable, but for the look and price, it’s a good choice! I own the chairs from IKEA, paid less than this because it has been a while. They’re fairly comfortable for occasional use and have held up very well for the use they’ve had as well as the ottoman I purchased with them. They’re a lot more modern than my normal style but when we got them it was the best deal for the money! I have the IKEA version as well, in the faux leather so I think it was a bit more. I love the looks of them but never sit in them! :). New follower by the way, really enjoying reading!